Wage growth is starting to pick up again after a rocky start to 2019. 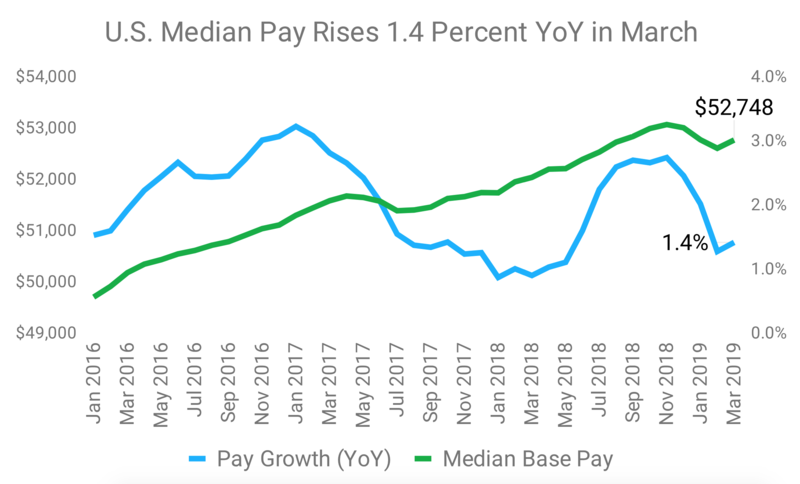 The latest edition of the Glassdoor Local Pay Reports shows that median base pay for full-time workers in the U.S. increased to $52,748 per year in March 2019, up 1.4 percent from last year. Despite a large drop in wage growth at the beginning of the year due to the government shutdown and economic uncertainty, wage growth is starting to perk back up. The fundamentals of the labor market remain strong with increasing labor force participation and hiring showing no signs of stopping. The strength of the labor market does contrast with economic storm clouds on the horizon. The inversion of the yield curve in March foreshadows a recession in the next few years, but for the coming months, we expect wage growth to accelerate further as the labor market continues to tighten. 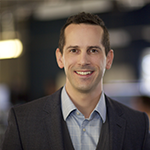 Let’s take a closer look at what happened in March with U.S. salaries on Glassdoor. Tech hub San Francisco saw the fastest annual pay growth for the eighth month in a row, with median base pay rising 2.5 percent to $71,706 per year, higher than any other U.S. metro we track. It was followed by Washington, D.C. (up 2.1 percent to $60,988 per year), Boston (up 2.0 percent to $60,654 per year) and Los Angeles (up 1.9 percent to $61,668 per year). The Houston metro area grew the slowest amongst U.S. metro areas, actually shrinking -0.1 percent to $55,653 per year. Philadelphia (up 1.4 percent to $56,442 per year) and Seattle (up 1.6 percent to $62,462 per year) rounded out the bottom three metros. With spring break season in full swing, March saw astounding double-digit pay growth for bartenders. Bartending often serves as an accessible job with potential for higher pay from tips, but what sets it apart from other lower-wage jobs is the heavy reliance on customer service and communication skills. Additionally, other low-wage jobs like cashiers and bank tellers are still seeing strong annual pay growth. Increases in the minimum wage across almost 21 states and D.C. in 2018 and 2019 are also supporting pay growth for low-wage jobs. Producer salaries are on the rise in March, reaching 4.5 percent year-over-year growth. Producers are increasingly being called on to develop new types of content like video or digital and to leverage new technologies, boosting wages for those who can utilize new skills. Even as the media industry evolves rapidly, Glassdoor research shows that producers are still one of the top 10 in-demand jobs in this sector. Wage growth for truck drivers topped 5 percent in March, continuing a 5-month streak of over 5 percent wage growth. As American consumer spending shifts online, more and more truck drivers are needed to transport goods and ship packages. The tight labor market for truck drivers is encouraging employers not only to raise wages, but also to experiment in order to attract new talent, whether it’s by increasing signing and referral bonuses, offering on-the-job training or reaching out to underrepresented groups like women. Claims adjuster saw strong wage growth in March, following a year of devastating natural disasters. The profession faces rising demand from increasingly costly natural disasters from last year’s record-breaking California wildfire season to March’s unprecedented flooding in the Midwest. Additionally, automation is improving the efficiency with which claims can be processed, putting further upward pressure on wages. While all pay growth is the result of both supply and demand for workers, these jobs offer useful clues about where any remaining pockets of weakness are in today’s otherwise strong labor market. Once again, three fields dominated the highest paying jobs in March: Health care, tech and professional services. Pharmacist, solutions architect, attorney and data scientist topped our list as the jobs with the highest U.S. median base pay in the March Local Pay Reports. You can view the full list of highest and lowest paying jobs as of March 2019 here. Like the Know Your Worth tool by Glassdoor, Local Pay Reports incorporate millions of salaries directly collected from U.S. workers by Glassdoor and apply a proprietary machine-learning algorithm to estimate near-real-time trends in local pay for ten U.S. metros and the nation as a whole. The Local Pay Reports estimate year-over-year growth in median base salaries by job title for 84 jobs across more than 15 job categories including health care, technology, retail and more. The reports also estimate median base pay by industry and employer size and provide a monthly trend of metro-level median base pay for each local market over the past four years. Our Local Pay Reports fill an important gap in our knowledge about wage growth at the local level for specific jobs. Official U.S. Bureau of Labor Statistics “Occupational Employment Statistics” are updated only once per year and use broad occupational groupings that can be confusing for job seekers. Local Pay Reports are released monthly—using the latest data from Glassdoor—and show pay for actual job titles that are easy for non-economists to understand. Read more in our full methodology and FAQs. The latest jobs report from the federal government is due out on Friday. This month, we expect to see 142,000 new jobs added to payrolls and an unemployment rate steady at 3.8 percent in March. See our full analysis for more commentary and predictions here. To learn more or subscribe to the monthly email alerts, visit: https://www.glassdoor.com/research/. The Glassdoor Local Pay Reports can be found here: https://www.glassdoor.com/research/local-pay-reports/. Press inquiries: To speak with the Glassdoor Economic Research team about this month’s report, email pr@glassdoor.com.